Status: Rare regular fall migrant statewide. Rare casual spring migrant statewide. Rare casual summer visitor statewide. Rare casual winter visitor Lake McConaughy, Keith Co. Documentation: Photograph: 9-16 Nov 1971 Sarpy Co (Bray et al 1986). Pacific Loon was formerly considered a North American subspecies of the Arctic Loon, G. arctica, but they are now considered to be distinct species (AOU 1998). We consider Nebraska records to be of pacifica, as indicated by Mollhoff (1987), although it is possible that arctica could occur in Nebraska (see Comments). 12-25 May 1999 adult basic Lake Ogallala, Keith Co (Jorgensen 2001). 19 Jul 1979 adult alternate Box Butte Reservoir, Dawes Co (Rosche 1982, Bray et al 1986). 11-12 Aug 2013 adult basic Branched Oak Lake, Lancaster Co (Silcock 2013b). There are about 70 reports, most documented, and most in the period 2-24 Nov. Earliest documented dates are 8-19 Oct 1980 Lake Minatare, Scotts Bluff Co and 16 Oct 1999 Lake Alice, and latest 6 Dec 1997 Swanson Reservoir, Hitchcock Co (Brogie 1998), 7 Dec 2017 Crescent Lake NWR, Garden Co (Dunning, eBird.org, https://ebird.org/view/checklist/S40967652), 9 Dec 1986 Lake North, Platte Co (Williams 1987), and an adult basic at Lake McConaughy 15 Dec 2002. Fall occurrences in Nebraska are consistent with records in neighboring states, suggesting that some fall migrants drift south inland from their arctic breeding grounds en route to wintering areas along the Pacific Coast. Spring migrants presumably move up the Pacific coast and fly a more direct route inland to breeding areas. High counts: 4 in Scotts Bluff Co 18 Nov 1999 and 3 at Lake Minatare 13-18 Nov 1999. 9 Jan 1999 first basic Lake McConaughy (Dinsmore 1999, Jorgensen 2001). Comments: Arctic Loon, which was previously lumped with Pacific Loon as one species, has been documented on several occasions along the West Coast and as close as Colorado (Leukering and Semo 2004). Observers should closely scrutinize any putative Pacific Loon in Nebraska due to the possibility of occurrence of Arctic Loon. Photograph (top) of a Pacific Loon at Branched Oak Lake, Lancaster Co 24 Oct 2009 by Joel G. Jorgensen. Dinsmore, S.J. 1999. 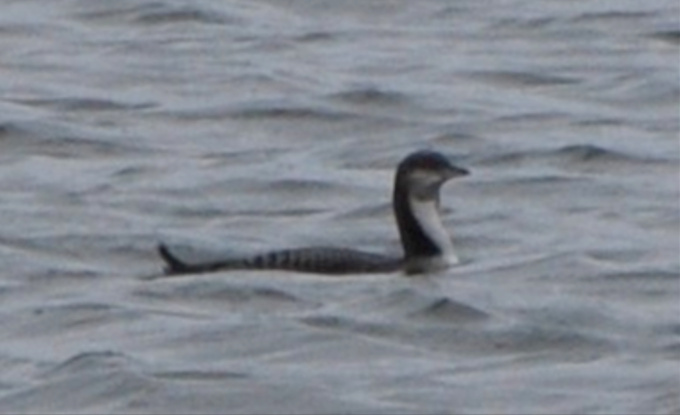 Two winter records of Pacific Loons at Lake McConaughy. NBR 67: 16-17. Leukering, T., and L.S. Semo. 2004. The 37th report of the Colorado Bird Records Committee. Colorado Birds 38: 73-88. Russell, R.W. 2002. Pacific Loon (Gavia pacifica). The Birds of North America. Silcock, W.R. 2000a. Summer Field Report, June and July 2000. NBR 68: 106-126. Silcock, W.R. 2000b. Fall Field Report, August-September 2000. NBR 68: 142-176. Silcock, W.R. 2006. Summer Field Report, June-July 2006. NBR 74: 78-95. Silcock, W.R. 2010. Spring Field Report, Mar 2010 to May 2010. NBR 78: 38-62. Silcock, W.R. 2013a. Spring Field Report, Mar 2013 to May 2013. NBR 81: 50-79. Silcock, W.R. 2013b. Fall Field Report, August-November 2013. NBR 81: 134-160.